At HAMMER PERFORMANCE, we have the expertise, equipment, and experience to provide virtually any machine shop services your Twin Cam might need! We are the EXPERTS in servicing Twin Cam heads! Don't trust your cylinder heads to just anybody, HAMMER PERFORMANCE specializes in cylinder head preparation and we have the tools and expertise to do the job right. Trust the experts at HAMMER PERFORMANCE with this critical job! There's nothing more important to a good running engine than proper ring seal, and ring seal is all about a straight, round bore sized perfectly for the piston and with a proper surface finish to encourage ring seating. Achieving those things though takes a combination of equipment, knowledge, and experience. 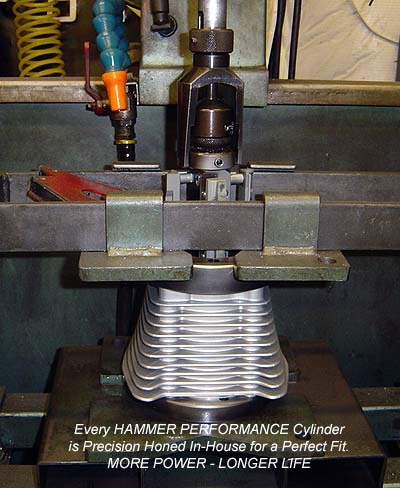 The experts at HAMMER PERFORMANCE have been boring and honing cylinders for years and have developed and refined a process that gives perfect results every time. We start this process by cleaning your head and base gasket surfaces thoroughly. We then clamp each cylinder into our specially designed fixture with a torque plate and bore it in a precision CNC Machine (see the video). Unlike most boring processes, our double sided boring head ensures a perfectly round bore because the cutters remain evenly loaded through the entire process. Coolant is constantly sprayed into the bore to eliminate distortions caused by heat and provide a smooth, even cut. Once the cylinder is bored, it's taken to our precision honing machine for final sizing and surface finish. The honing process is cooled with a constant flow of honing oil again to prevent distortions caused by excess heat. Using precision measuring instruments with a resolution down to a ten-thousandth of an inch (.0001) we hone the cylinder for a perfect fit to the piston. Proper clearance gives better ring seal, longer life, and MORE POWER. For the ultimate in performance and longevity, pick up a set of Sledge Hammer Pistons when you get your cylinders bored and honed. We give a substantial break on the price when you do, and you get some of the best HD/Buell pistons available today. If you want the highest quality cylinder boring and honing service for your Twin Cam, matched to the best pistons you can buy, look no farther than HAMMER PERFORMANCE! Note: Save money by purchasing a complete kit from us instead. We bundle the boring service, a set of premium quality Sledge Hammer pistons & rings, and a top quality Cometic EST top end gasket set, and give a substantial break on the total price vs. buying everything separately. Don't trust this critical procedure to just anyone! Let HAMMER PERFORMANCE do it right! 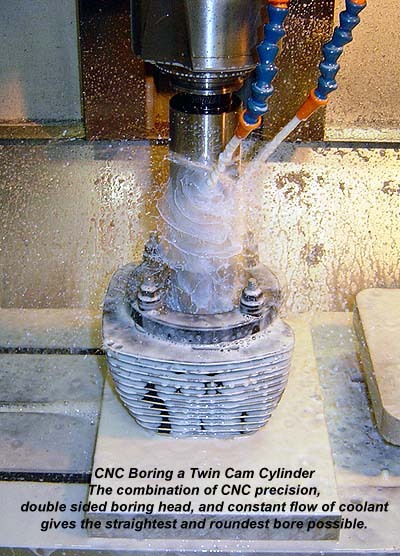 Accurate case boring can make all the difference in the world for long piston life. The bores must be straight, at a precise 45 degree angle from each other, and aimed squarely at the crankshaft. HAMMER PERFORMANCE has developed a 4-axis CNC process to perform this critical task that does a perfect job first time, every time! This process has been used hundreds of times over the years and it's proven to result in reliable, powerful engines. Upgrade this failure prone area BEFORE it fails! 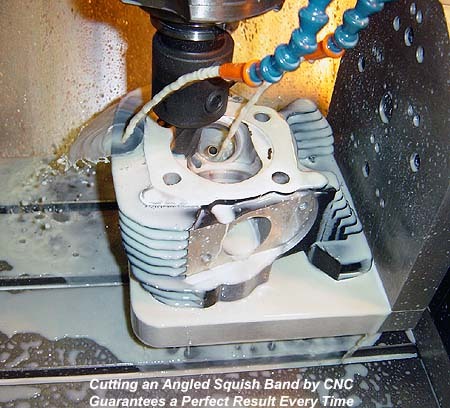 In 2003, HD applied a cost reduction to the Twin Cam engine in the form of a single roller bearing on the sprocket shaft and a thrust washer to control end play. This setup is adequate for the stock motor but has proven to be a weak point in high performance applications. Fortunately, Hammer Performance has the solution. We can convert your sprocket shaft bearing to the dual tapered Timken bearing arrangement of the earlier models, which provides much more bearing load capability as well as better control of the end play. If you don't see what you're looking for, please give us a call. Chances are we can either do it for you or send you to someone who can.